After more than two weeks of deliberation Troy Athletic Director John Hartwell introduced Phil Cunningham as the successor to Don Masteri as head coach of the basketball program. 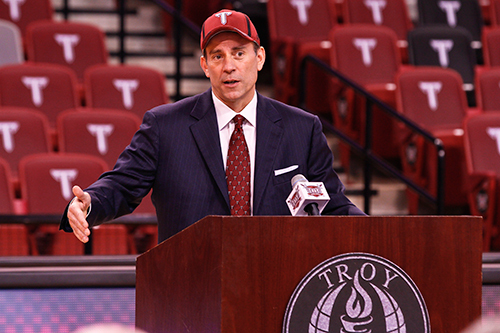 “I am very excited about the future of Troy basketball and it being in the hands of Phil Cunningham,” said Hartwell. The hire brings to an end a search that began 17 days ago when Maestri announced his retirement following the team’s loss to Arkansas State in the quarterfinals of the Sun Belt Championships. Cunningham’s resume spans over 20 years and was an assistant coach at several programs in the southeast, including Georgia State, Mississippi State, and Western Kentucky. “It is a tremendous honor and privilege to be named the new head men’s basketball coach at Troy University,” said Cunningham.